The second program I am going to review today is also a very new HYIP program called Snowbit. It is another cryptocurrency mining program, to be more precise - Bitcoin mining. It has been online for 11 days in total, but it joined Standard Listing on DavidNews.com monitor on April 1, 2018. Currently, it has the status “PAYING”. I have reinvested BTC 0.03067200 in the program and will keep you updated about the payments status on DavidNews.com monitor. Snowbit claims that they are investing new renewable energy sources to mine Bitcoins without any additional electricity costs. So, let's take a closer look what Snowbit is about. 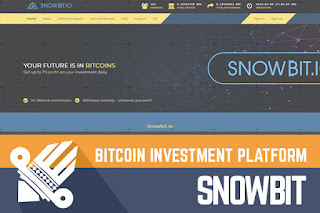 Like some other cryptocurrency mining HYIP’s I have reviewed recently, the Bitcoin-only program Snowbit also offers a lifetime investment plan with initial deposit included in the payments. The % daily profit of the amount of the investment is divided as follows: 0.0010 BTC - 0.0300 BTC = 1.50% daily, 0.0301 BTC - 0.1500 BTC = 3.50% daily, 0.1501 BTC - 0.3000 BTC = 5.50% daily, 0.3001 BTC - 1.0000 BTC = 6.25% daily, 1.0010 BTC - 10.0000 BTC = 6.50% daily and 10.0010 BTC - 30.0000 BTC = 7.00% daily. The minimum investment amount is 0.001 BTC, the maximum – 30 BTC. The minimum withdrawal amount is 0.00150000 BTC. Withdrawal requests are processed instantly. Keep reading in case this basic information about the investment plans grabbed your attention. As I said, Snowbit is one among a large list of cryptocurrencies mining inspired programs I have reviewed lately. However, the main characteristic that differs it from many other programs is that it is a Bitcoin-only program. I believe this is the main aspect that will both attract and turn down the potential investors. Snowbit admins have chosen quite loud marketing slogan - they call themselves a new age bitcoin mining service. Why new age? They claim to use renewable energy sources to produce bitcoins, at a lower cost. Moreover, the admins claim that the program is formed by two of Wall Street's finest financial advisors. Want to know more about Snowbit and cloud mining? Feel free to read their full legend. This time I won’t talk too much about the website design. Why? Because this website is another standard HYIP website – simple design, standard color scheme and some sales-oriented statistics (members, total deposit, withdrawals). However, if I compare the website of Snowbit and the one I review earlier today, I have to say that this one is a bit more investor-friendly. Firstly, investment calculator (it's not the easiest to use calculator though) and a bit more informative FAQ page. Another thing that drew my attention was the selection of languages. You don’t find a combination of only English and German among HYIP websites that often. Of course, it might be the main target audiences which admins wanted to address. According to the data from Alexa rank – most traffic website receives is from Russia. Sure, Alexa must not be considered as 100% proof, but we must perceive it as a hint and assume that there are some visitors coming from Russia. Of course, the program is not very old and I’m surprised Alexa shows any data. Therefore, let’s wait another while and see if data will change and Germany will appear in the list of traffic sources. There are many different investment plan options available according to the amount of the deposit. I usually use the amount of $200 for investment plan calculations. Therefore, it falls into the 3.5% daily investment plan (0.0301 BTC - 0.1500 BTC). An investment of BTC 0.03067200 (approx. $200) in Snowbit would generate a daily return of 0,000355795 BTC and your investment would reach the break-even point within 29 days. If you don’t withdrawal the initial deposit and decide to keep it in for a while, then within 58 days such deposit would generate a net profit of a sum, which is equal to the initial deposit. If the program stays in the game for so long, then probably this one is worth considering. Feel free to do your own calculations and pick any amount you like to find out about the potential profit! How to choose the right program to invest in between the many cryptocurrencies inspired program? Moreover, if the programs are quite new and are offering long-term investment plans! There are some factors that raise interest among potential investors. This time we are looking at a Bitcoin-only program with a “sustainable” mining legend and with net interest rate varying from 1.5 to 7%. However, always remember that a HYIP is a HYIP. Therefore, if you ever decide to make any investments, don’t invest more than you can afford to lose! Have you already made an investment in Snowbit and have any useful information to share with us? Please drop a message in the chat box to share your experience! Investment plans: 1.5% up to 7% daily forever. Initial deposit included in the payments.